Diegem held a Superprestige race on Monday under the lights. And if you read the snippit from my last post, it was frickin' awesome. Superprestige is a season series consiting of around 10 races in Belgium and the Netherlands. It's one of three season. The Superprestige is organized by the trade teams, as opposed to the national teams like the World Cup. I also learned that night that the Superprestige race has its' own soundtrack. The Junior race went off first, and immediately it started splitting up. Yannick Eckmann, a German rider who lives in Boulder, CO and is part of the camp, was towards the front. He's a strong rider who's currently in the top 5 in UCI points. He was steadily in the 10 all day, but had crashed in Zolder the day before and had a sore knee. He did end up finishing 10th. The other groups of camp riders were scattered throughout the rest of the standings, but meeting them at the finish line they were all pumped. Andrew Dillman, a Junior racer who's been the top American for a few races, dropped his chain on the third corner after the start. He slowly started picking off riders during the race, but got the most joy out of bunny hopping the barriers. He hopped them one lap and got big cheers. He didn't hop them the next lap and got some jeers. So the last lap he hopped them again and it was a celebration. 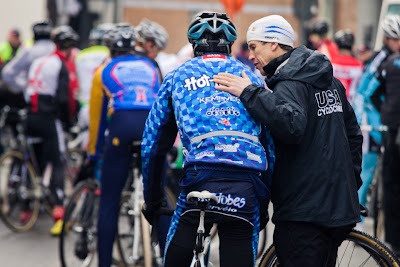 The other thing that stood out about the Junior race was watching Geoff Proctor engage with the officials about making sure the American riders got their proper call-ups. It seems to me that at the World Cup that they go strictly by the book, but at this race it seemed a little more lax. At one point, Bjorn Fox looked like he wasn't getting called up so Geoff just sent him up anyway. Nobody said anything. Geoff really does so much on race day...including making sure these riders get what's coming to them. It was like that all day. The barriers were up by the beer tent, so perhaps that was part of the energy on that part of the course. One of the interesting things about the crowd, especially with the elite race, is that the roars are huge for the front group. But the farther it gets back in the crowds, the quieter it gets. It can be an odd thing, with the crowd just staring at the riders and not making noise. Ryan Iddings, an elite racer, described it in his blog post for cyclingnews.com....saying that you can hear the crickets chirping. Not that there are crickets out there...but you get it. Right? The crowd was large. I searched the internet for numbers, but was unsuccesful in finding a number. I'd say 20,000+ thousand. Maybe that's high, and maybe it's low....maybe that's why I settled on that number. All of the top riders have huge fan clubs. Supporters if you will, that carry large banners and flags, and wear jackets that show their affiliation. They can be somewhat aggressive about it as well. At the podium presentation after Neils Albert won, his supporters were right behind me signing at the top of their lungs. Waving flags, screaming for me to take their photo, and cheering loudly when he stepped onto the top step of the podium. 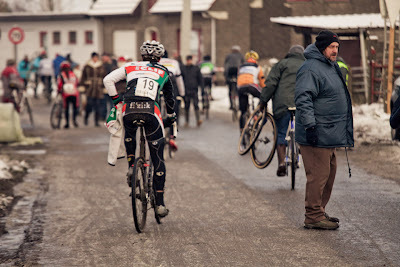 Speaking of taking photos, I got more request at Diegem to take photos of fans than any other race so far. It usually starts with a couple of folks saying something to me in Flemish. I say "English" and then they smile. Most start talking in English, but some can't. Whatever the case, I get the gist of it. They then put their arm around their buddy and smile big for the camera. 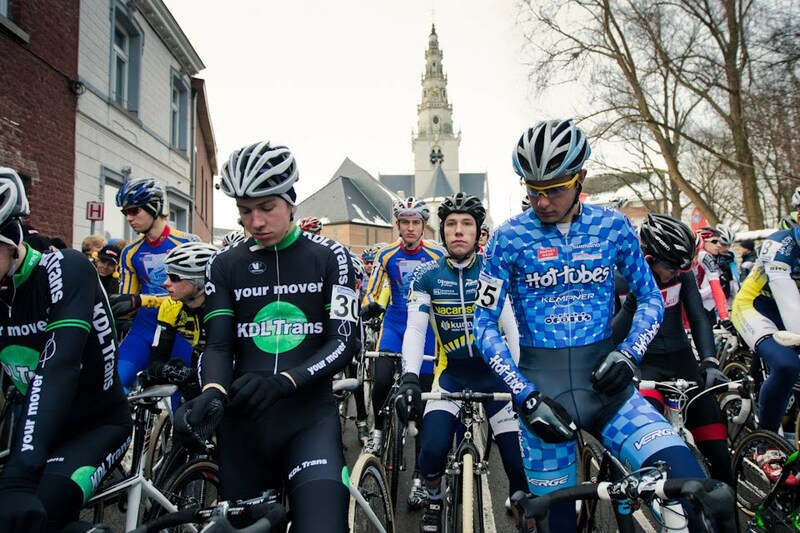 The best way I can describe Diegem is what I said earlier, Rolling Thunder times 1,000....maybe more. It's just a huge party with a bike race going through it. The screams, the flags, the banging on the barriers and the singing. 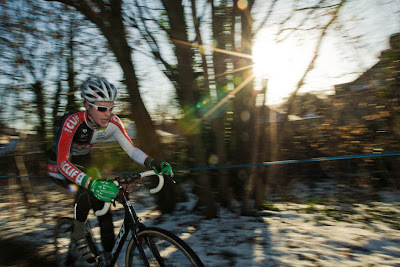 For some photos and a short article on I wrote for Cyclocross Magazine you can go here. And to view additional photos, you can visit here. 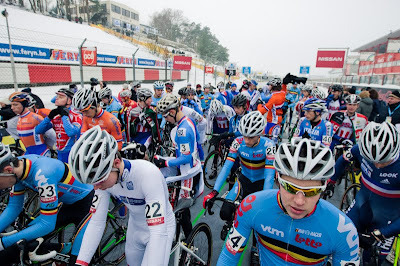 The second World Cup for me was in Zolder. At least I think Zolder is a town, for sure it's an F1 Speedway. 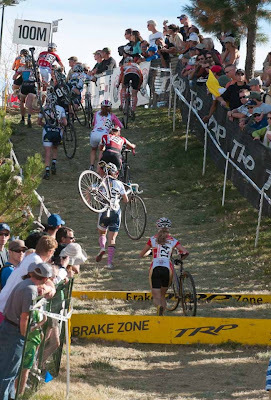 The other things that I know off the top of my head about it is that it hosts a lot of World Cup cross races, and a couple of years ago it hosted the World Championships in Cyclocross and there were 60,000 spectators. I don't think their were that many this year, but there were a lot. At one point, I think a quarter of them were in the beer tent. In fact, an hour after the race was over, I think all those folks were still in the beer tent singing Neil Diamond's "Sweet Caroline". 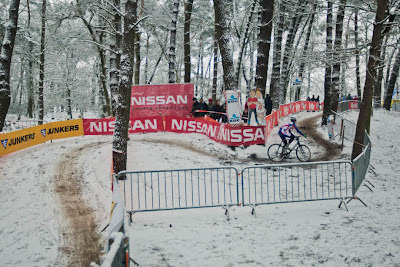 Zolder, like the rest of the races I've shot here, was snowy. And not only snowy, but compact, slick snow. This led to a lot of crashes...both for the racers, and for the people walking around. The car I was traveling in had to get pushed out of places a couple of times. But the more beer the Belgians drink, the more they want to help you push your car. If you poke around on the internet, you might be able to find some highlights of the race. And those highlights will most likely be one crash after another. The whole race was a crash....just amazing. For the Americans, Danny Summerhill was the top placed racer in any of the racers (as far as the Euro Cross Campers go... Katie Compton crushed the women's field. I mean crushed it). 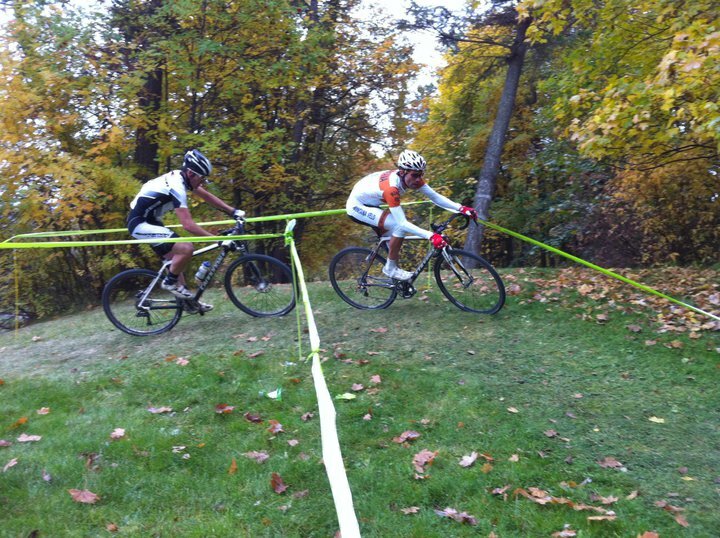 Danny was hovering around the top 10 and crashed 3 times alone on the last lap. He finished 13th. I'll look for a video to post soon. I just threw up a link to the photos from the race. There's also a link to the race from Diegem last night. I really want to write more about that, and will in the next day or two. I've been going to sporting events since I was two (that's what happen when you grow up where I did...you start with college football pretty early). 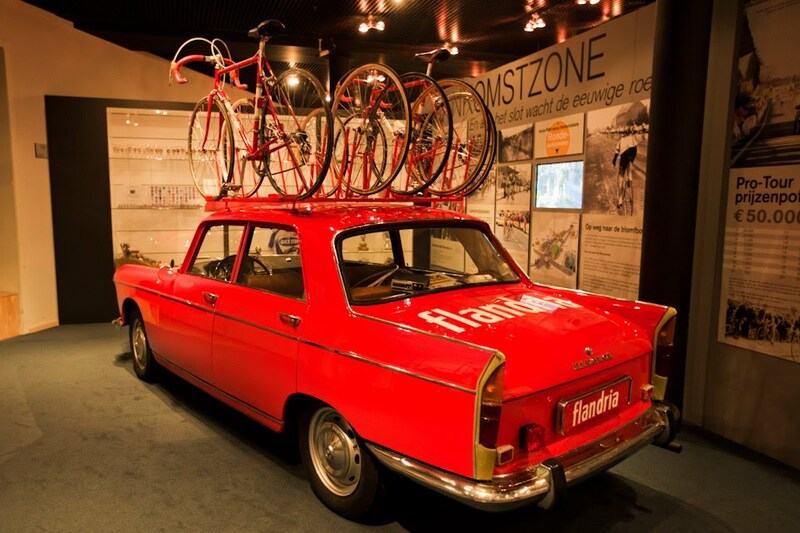 I've been to all sorts of pro and college sporting events.... World Series games, National Championship games, Major golf and tennis events, a World Cup Soccer event, and the last two weeks of the 2004 Tour de France. 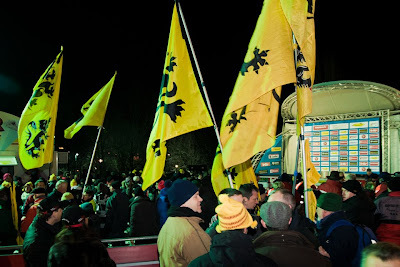 But last night's cyclocross race through the streets of Diegem topped them all. It ended with me shooting the podium, and Neils Albert's fans right behind me singing at the top of their lungs (He won). That was right after he had cross the finish line where there must have been 2,000 people banging on the barriers. I'm getting chills just thinking about it. (Shaun.....Rolling Thunder needs barriers for folks to bang on). But more about that later. There's an early wake up call for a race tomorrow. 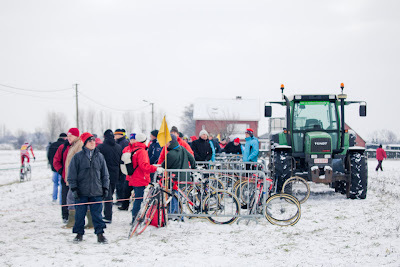 I saw something yesterday that made me realize why Belgians are so good at cyclocross. 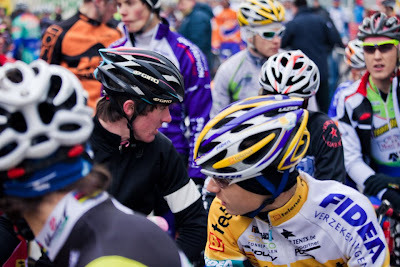 Two kids, fully kitted out, were zipping around on their cross bikes between the U23 and Elite races at Diegem. The one in green was working on his dismounts and shouldering his bike. Someone later told me it was Sven Nys' son. If he has Sven's genetics, I'd say he has a couple of legs up on his future competitors. He was pretty smooth in his transitions. 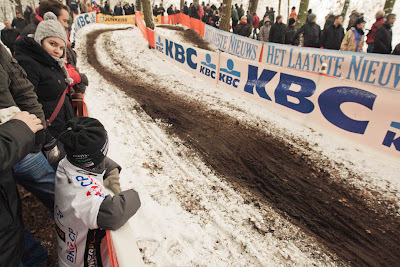 More to come from the World Cup in Zolder, and the night racing in Diegem. 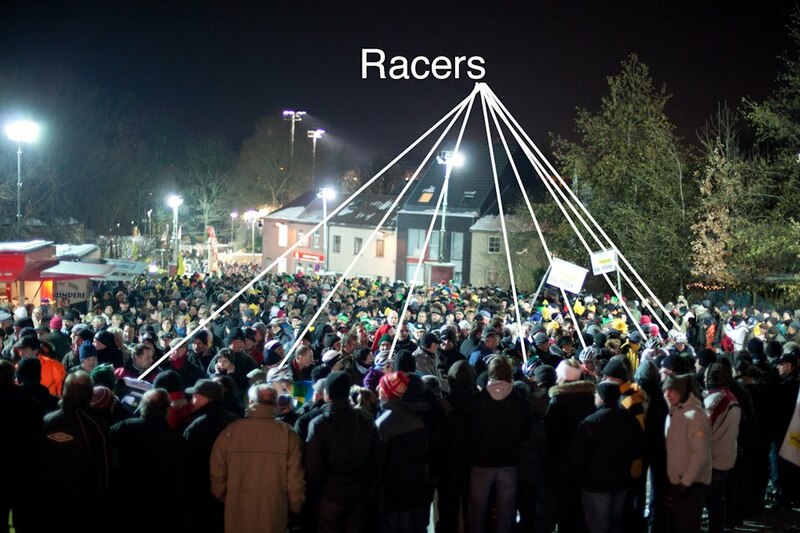 The race in Diegem under the lights was amazing. Think Rolling Thunder times 1,000....at least. The course completely lined with spectators, sometimes 6 and 7 deep. And the beer tent almost the size of a football field. 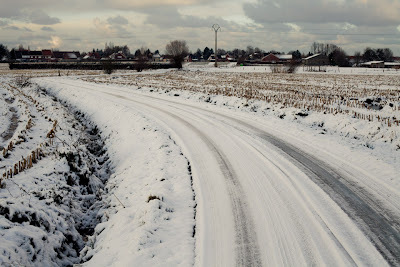 Today was a "B" race in Beernem, Belgium. I don't know if the town has anything to do with beer, but they sure do like their cyclocross. A big crowd, and big field showed up on a sunny Christmas day to race and spectate. Yep...you heard me...it was sunny!! Here's a link to some images. 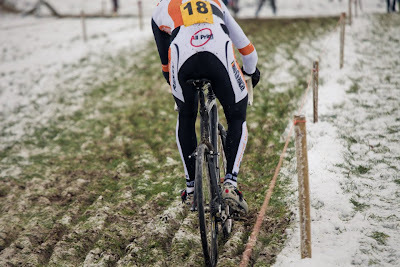 Also be sure to check Cyclocross Magazine later in the day for a unique gallery. That's it for now. Tomorrow is World Cup action from Zolder. Wake up early, brew some coffee, and watch it on the internet. 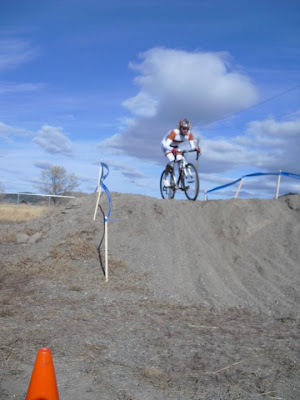 The training races in Clinton, MT were always some of my favorite racing of the year. Low key, pretty flat, and everybody was raring to go early in the year. Yesterday at the Euro Cross Camp they had a team training race. Ryan Trebon, a staple of American cross racing the last few years (and multiple Euro Cross Camp participant) came over to join in the fun. And the racing seemed just as fun as those Clinton races...but a lot more muddy. The racers pulled out from the house just before noon and headed to the course that Geoff had set up earlier in the day. In true Euro Director Sportif style, Geoff gunned the engine and passed the racers on the way to the course at Mach II. Great Fun. 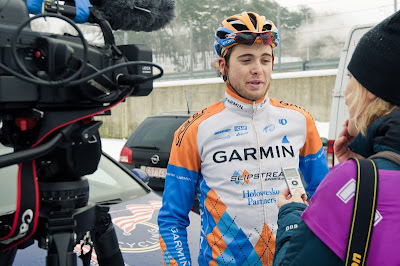 Also along for the ride was Lyne Lamoureax, a sportswriter from North America who covers cycling all over Europe. She also runs the website Podium Insight. Geoff had ridden over and set up the course in the morning. It was going to be run down along the canal just on the edge of Izegem, and it was a classic Beligum day from my limited experience here. Wet...just a damp, wet, snowy and somewhat muddy track, with an ultra thick fog hanging in the air. I loved it. From a photographers point of view, it couldn't be much better. During the couple of warm-up laps, a couple of riders fell, and were instantly soaked. The whole ground was a puddle it seemed like. The riders lined up for the start. It was the first cross race I had ever seen where all of the riders were starting on the front row. The race was to be 30 minutes. The winner of each division (elite, U23 and junior) would get excused from house chores for a day, with the overall winner getting a signed Sven Nys poster. Ryan Trebon got the whole shot, with Zach McDonald on his wheel and Ryan Iddings close behind. 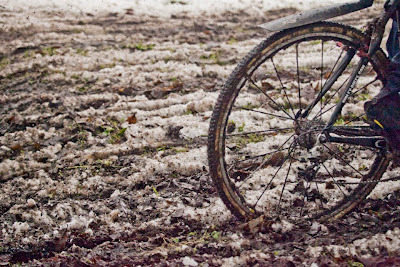 The riders flew around in the mud, through the trees, up and down muddy hills and 30 minutes later, with a bike throw, Zach McDonald took the victory over Ryan Trebone. Though truth be told, in true training race spirit, it seemed though most riders were taking different routes throughout the whole course. I'm not sure any rider rode the same line for each route. The highlight of the race for me was when Bjorn Fox flew over his bars in a particularly muddy section and slid for what seemed like 20 feet. He bounced right back up (as juniors are apt to do) and said, "Wow...took a wrong line there." The riders didn't hang around too long afterward, not wanting to cool down, and headed back to the house. About half the crew got their bikes power-washed by the mechanics and then headed out for a training ride. Todd Anderson (former Missoulian, and mechanic at Open Road in the early 90's) jumped in the Team USA wagon and drove while I hung out the passenger window shooting for the first 2k. 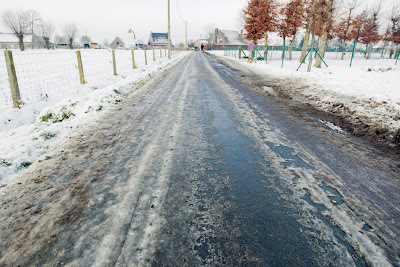 Danny Summerhill spent half that time riding wheelies for me through the slush of the small Belgium backroads. Back at the house I hung out for a while as riders washed clothes, watch videos on the internet, and ate food. When the first half of the training ride group got back, we headed into town for pizza, pastries and coffee...led by Ryan Trebon. Ryan is the best leader through crowded streets you could ever hope for. He's so damn tall, that he's easy to follow. 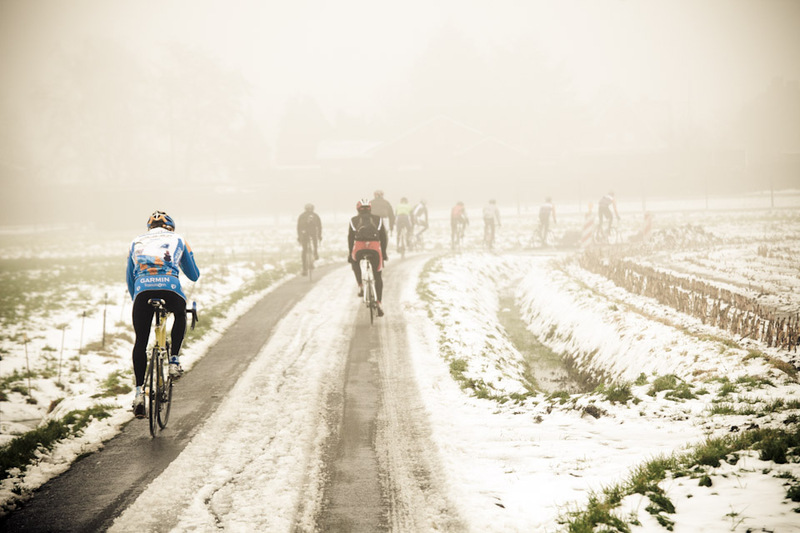 While gaining valuable racing experience in Belgium is the main goal for most of these riders, learning how to train and recover like a professional are also part of the program. 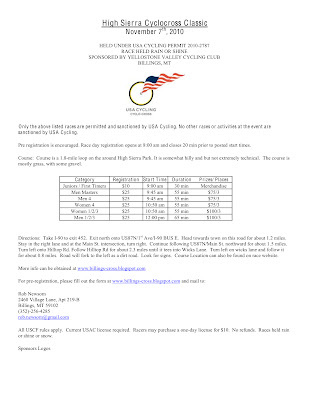 The Euro Cross Camp has to be an amazing experience for these folks. I'm just a peripheral element to the camp, and it's an amazing experience for me. For more photos from today, hit this word to jump to the site. UM Triathlon Legend and Rolling Thunder/Griz Tri Announcer Downtown Joel Brown is moving. He's asked that I don't make a big deal of it.......so obviously I'm going to make a big deal of it. 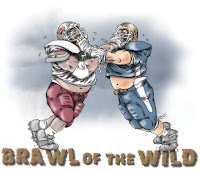 It was holiday time, and the Missoula student exodus had began. Ben Horan was back for the weekend and Matt and JB decided to throw a holiday showcase party. The party would include a gift exchange, and holiday showcase (talent show). I'd heard stories of JB being able to rip it up on the keyboard but I had yet to experience it. Matt welcomed us in an offered us a seat in the living room. I walked around the corner to see Downtown JB in dimly lit room working the keyboard. I noticed right away that he was focused and super into the jams. JB: Want to hear something? JB proceeded to pump out the early 2000 Club Hit, Nelly - Hot in Here. I'll never forget it. 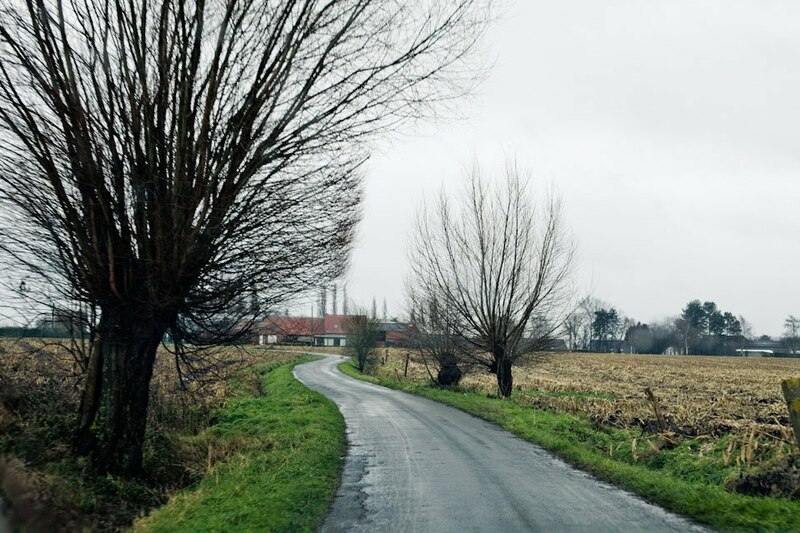 Sorry for the interruption on Tom's Belgium Reports. Great work Tom! 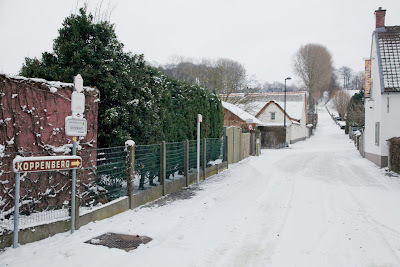 I drove an hour and a half north early Sunday morning to the town of Kalmthout, just south of the border with the Netherlands. Thank goodness for the GPS navigation system. I don't know how visitors navigate these roads around here without those. 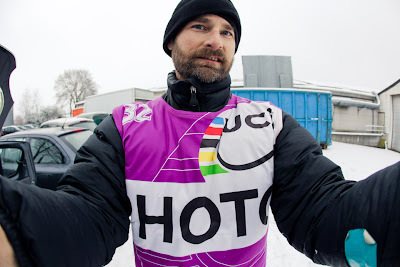 I had been in touch with the press officer for the race beforehand and pulled right into the parking lot, walked into the press room and got one of those PHOTO vest. Just like the photographers at all the big races. With this vest, I could go anywhere....and I did...just because I could. You know those guys that are always just past the finish line at the big Euro races, who seem like they are in the way. Well, I was one of those folks. That's the best spot in the house! There were four races on Sunday and I was out there for all four. The Juniors started it off, and I couldn't believe how fast they were going. I talked to one of the USA Juniors afterwards, and he said that he's usually one of the fastest in the States, and it blew him away. That, and all of the flying elbows, made it tough. One of the campers is a German national, Yannick Eckmann, though he lives in Colorado. 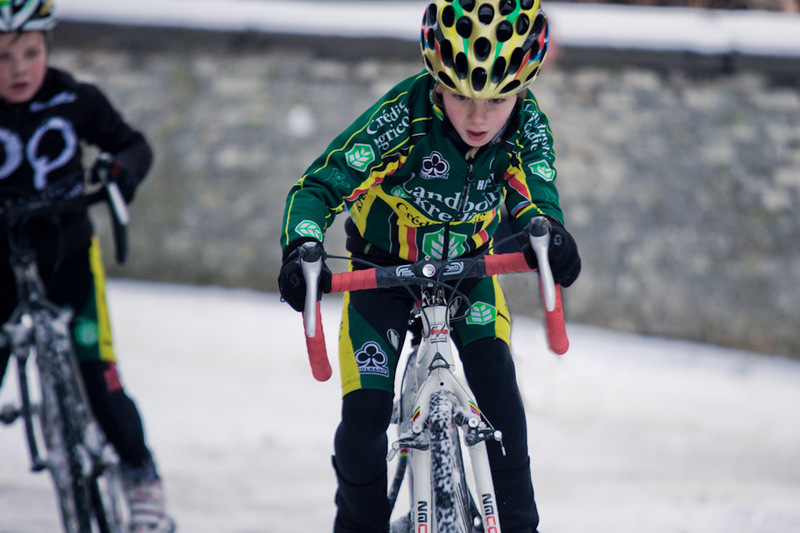 He was leading for much of the Junior race, and ended up 6th. It seems as though a lot of these races, there is a lead group of 5 or 6 that develops after a lap or two, and they just keep pulling away. The track was narrow for the most part, really single-tracky, and it made passing challenging. There was one pavement section where you had to make a go of it. So basically it seemed that if you weren't up front after the first half lap, you were resigned to finishing about where you were. As fast as the Junior race was, the lead group of the U23 race was blazing. Danny Summerhill and Zach McDonald seem to finish 1 and 2 in most of the US races, and even crack the top 10 in the Elite at National races. They were going good, and finished in the low 20's. They both started on the third row, and it seemed as though they held their spots well, if not moving up a bit. I was at the finish line for the sprint, and it was an all-out sprint, with the leader actually getting a little gap, turning around and blowing a kiss to the two folks he just beat. The sprint at the finish is pretty heart stopping, especially in Belgium when their national racers are involved. The whole crowd starts banging on the barriers and it feels like it's actually shaking the ground. The top two were Belgiums and the third guy was Dutch. Those Belgiums do have a pretty good grasp on things. 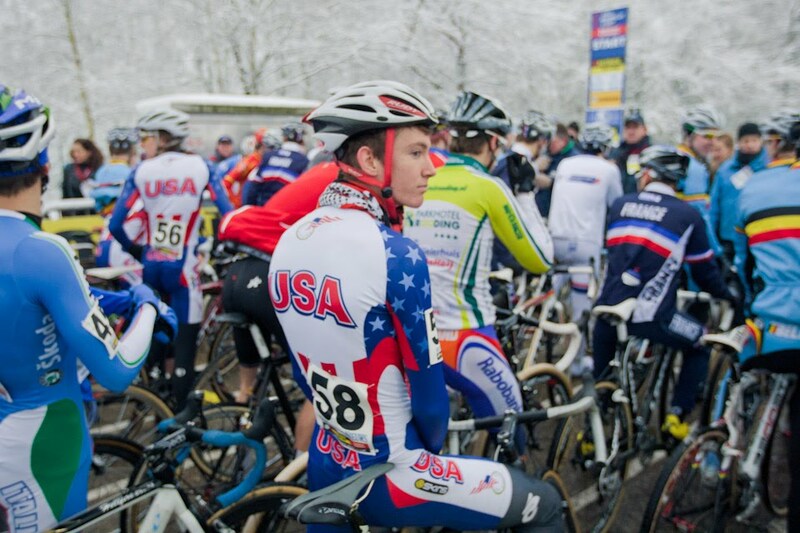 It's really cool to see the Juniors and U23's racing in their National kits. As a photographer, it's easy to pick them out. I watched a lot of the women's race, but just shot a few images. There are no women campers, so there wasn't a need to shoot. But one thought from the women's race..... Katie Compton. 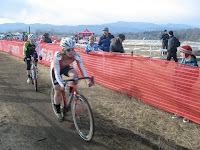 She was the first one called up, but halfway through the first lap three other gals had a 10 second gap on her. She made that up by the end of the lap, and then for 3 laps, she just sat on. I could see that she wasn't really working that hard, but when she attacked on lap 4 she immediately got 30 seconds. It looked like she was just going so so so much faster than everybody else. Between the women's and elite race I hung out in the press room. Wow...that's sweet. I mean, the accommodations are not that special, but to get inside with seats, wifi and free drinks is hard to beat. The drinks were all lined up on a table in the front of the room... Pepsi, coffee, OJ and whiskey (with little plastic shot glasses beside it). The crowd for the elite race was out, as were the banners, supporter jackets, and a santa claus band. Like the other races, the fast guys moved to the front and just kept pulling away. You know at Rolling Thunder on the hill on the backside, where folks scream and yell? That's kind of how it was over the whole course there. You could always hear where the leaders where because the roar of the crowd just seemed to follow them wherever they went. During the elite race the snow started to lightly fall, and just got heavier as the race went on. It was somewhat surreal, being in a forest, with screaming fans and bike racers flying between them. While it was hard to tell how much faster the Elites were going than the other groups, I could really notice it on the technical sections....they just didn't slow down through there. 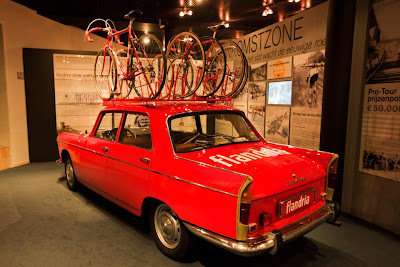 While the racing was the main attraction, there were all sorts of other pieces that I was enamored with. The food carts (I did get frites, though I opted for ketchup instead of mayo); the crowd (and so many people wanted to talk to me); the signs; the support jackets; those cameras on those moving cranes that can are up in the air; and did I mention the crowd. Everyone seemed just so happy and festive. I noted a few times how encouraging they were, even to the folks towards the back riding solo. I was exhausted afterwards, and not looking forward to my hour and a half drive back. I learned though, that the Belgium people are used to driving in the dumping snow. 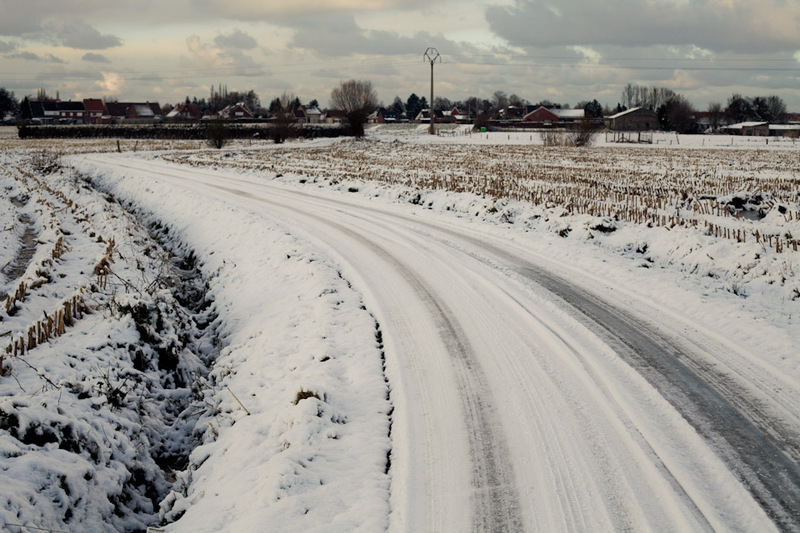 The main highways were quickly accumulating snow and it was slow going for over three hours home. I think I did pass the one snowplow in the country....and it was just sitting on the side of the road. For more photos from the World Cup in Kalmthout, go here. 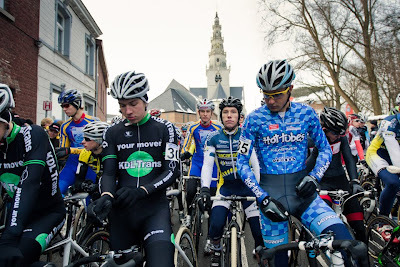 And for more photos from the small Saturday race in Lichtervelde, you can go here. Thanks for reading. More to follow. 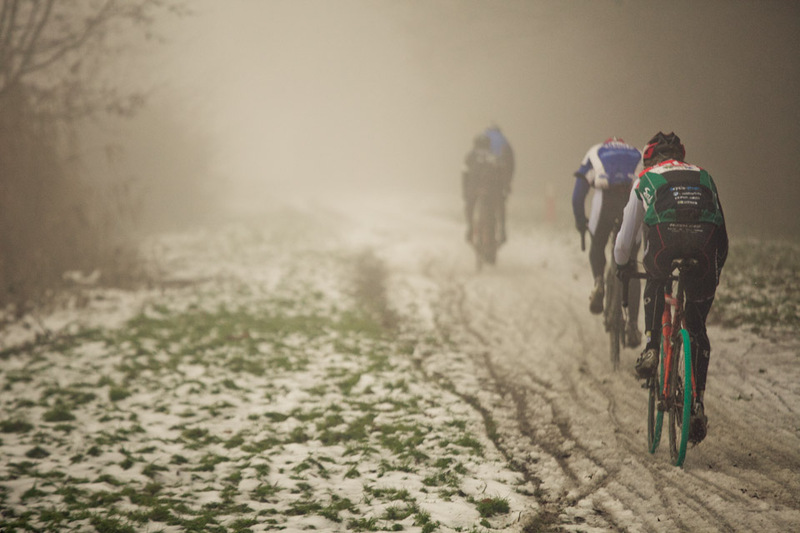 The first race of the Euro Cross Camp was a small local race, a “B” race in Belgium, in the town of Lichtervelde. A couple of exits up the road from the USA house in Izegem, the race was held on, by all accounts, a cow pasture. A few things stood out to me about the race, first off, there is an entry fee of 5 Euros for everyone but racers...even the mechanics. Looking at the course and surrounds, it didn’t seem like it was that much different than racing at Fort Missoula on Wednesday nights, but upon closer inspection, it had everything the big races had. 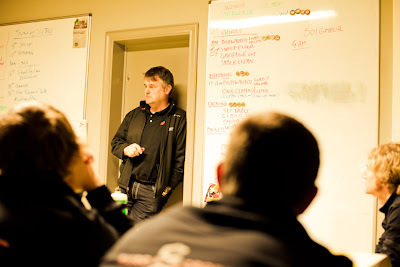 A warm room to change in; a snack trailer that sold frites, brats and the such; an ambulance and emergency personnel on site; crowd control; a podium; two separate pits, and an announcer. The level of support here for cross racing is really impressive. I expected it at the larger races, but it seems to be case at the smaller ones as well. 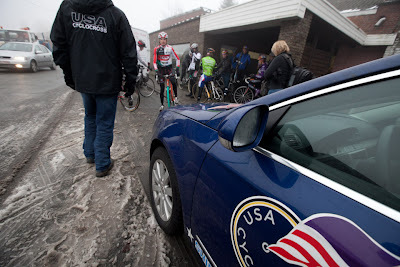 There was a Masters races going when I pulled up, but I hung out with the USA juniors as they warmed up. The staff of the Camp certainly does provide pro-level support for the campers. 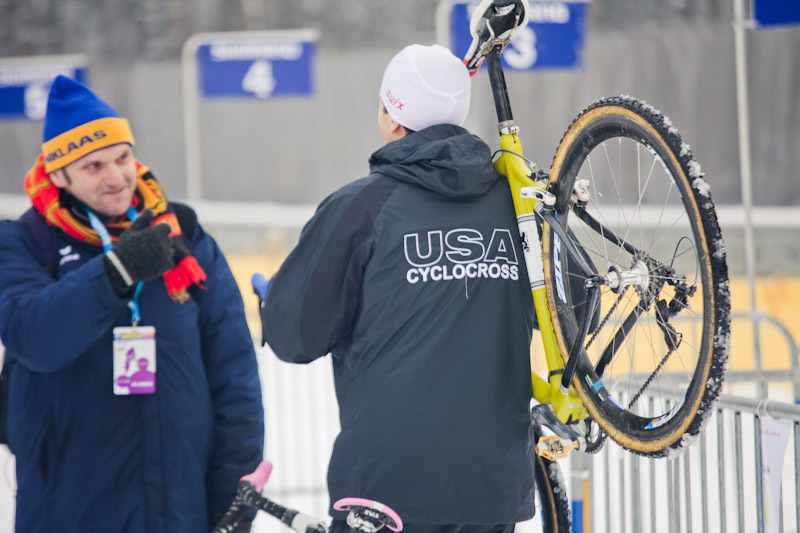 A tent was set up to ride trainers to warm up in, bikes were being tuned, numbers were pinned onto the riders as they spun on the trainers, and finally the mechanics took spare bikes and wheels to the pit area. 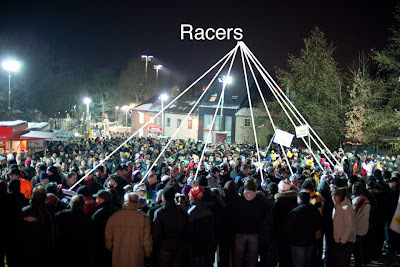 While the care for the campers is somewhat expected, all of the Belgium racers had their own support, which looked to be made up mostly of family members. From gathering warm-up jackets at the start, to washing bikes in the pit, all of the racers at this local “B” racer were kitted out and fully supported. I have heard Geoff talk about how Belgium cross courses were dangerous “back in the day”, but that things were a lot different now. This course was flat, with no barriers, and one run-up that could be ridden with some momentum, making it seem pretty boring. But it turned out to be one of the sketchiest courses that I had ever seen. What made it so sketchy to me was that it had ruts that were 3” to 4” deep, and completely frozen solid. 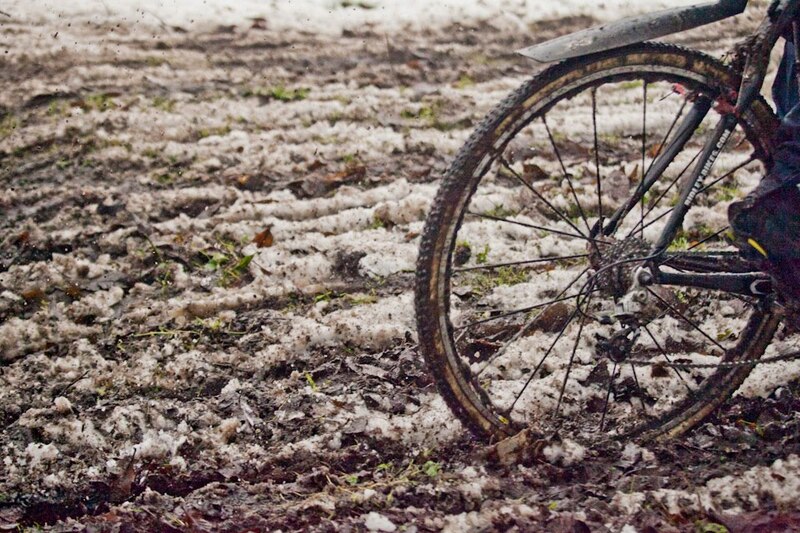 I don’t know if it had been ridden during the week when it was damp and then frozen or what, but it was as hard as concrete. When riders crashed to the ground (and they did), it looked like it really hurt (it did). 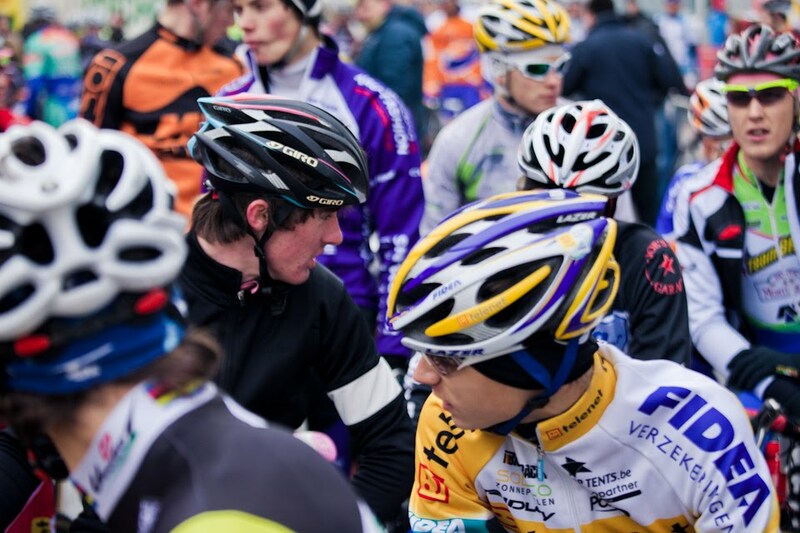 One Belgium Junior rider landed on his face, breaking his nose. By the end the last race of the day I saw racers shouldering their bikes and running through the worst part of the ruts. Seemed like the right thing to do. Most of the racers from the camp pulled out at some point. 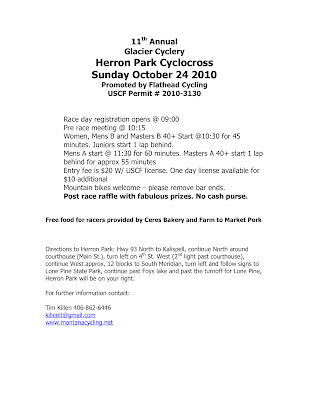 This was part of the plan, as there was an early departure time the next day, and a World Cup race to be ridden. The day served as a nice little introduction to some of the campers (and the photographer) to racing in Belgium. For additional photos, go to the EuroCrossCamp’s website here. Photos will also go up on the EuroCrossCamp Facebook site the day after races, feel free to follow that here. John Curry placed 5th in the masters 30-34 race. What an excellent result for John, GAS, and Cycling in Montana. Frank had bad luck, but a nice race. Hit from behind first lap. Collected his bike. Fought back to 5th place. Rolled a tire. Ran to the pits. Spare bike. Finished 18th. Frank is tough. MT state champ Frank G finished 19th behind a stacked 45-49 field. John Curry was 16th in his time trial for the 30-34 group and will start in the second row. I did not preview Landen in my initial write-up, but this up and comer deserves a huge shout out. Landen won the state championships in the cat 4's. He's an amazing athlete. 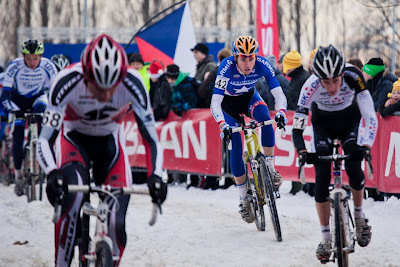 He proved that today with a 17th in his first appearance at nationals. Landen is from Helena and also is an excellent nordic skier. He had 44 competitors in his field. Curry 7th in time trial before 12pm MST start. She will be on the front row. 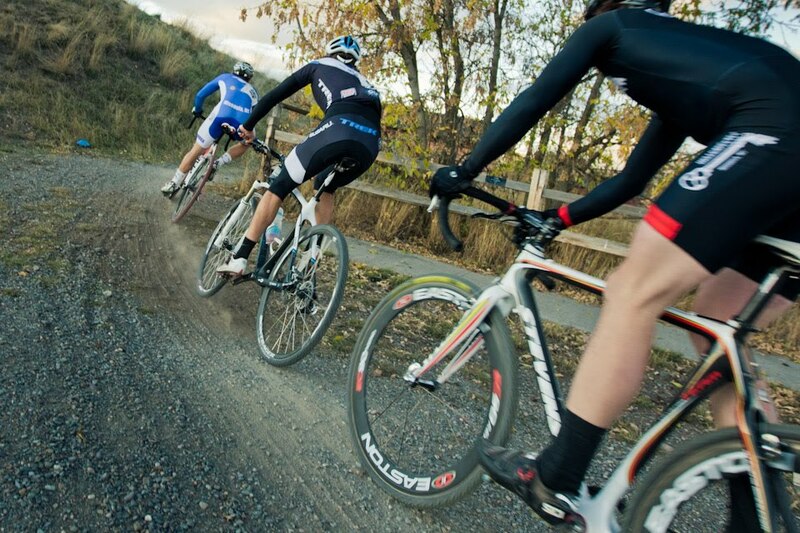 This year's batch of cyclocrossers headed to Bend is the best of the best in Montana. LISA CURRY - Mstr 30-34 - 1pm Friday - You don't really think of Lisa as a master but she's going to lay it out for a title in the 30-34 category. Defending champ Barb Howe is not registered but but 3rd and 4th Smith and Studley are. 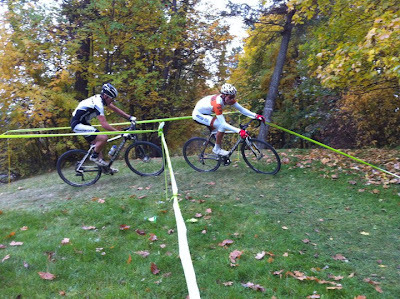 Head to head Curry has only beat Studley once (Jingle Cross #1 6th and 7th). 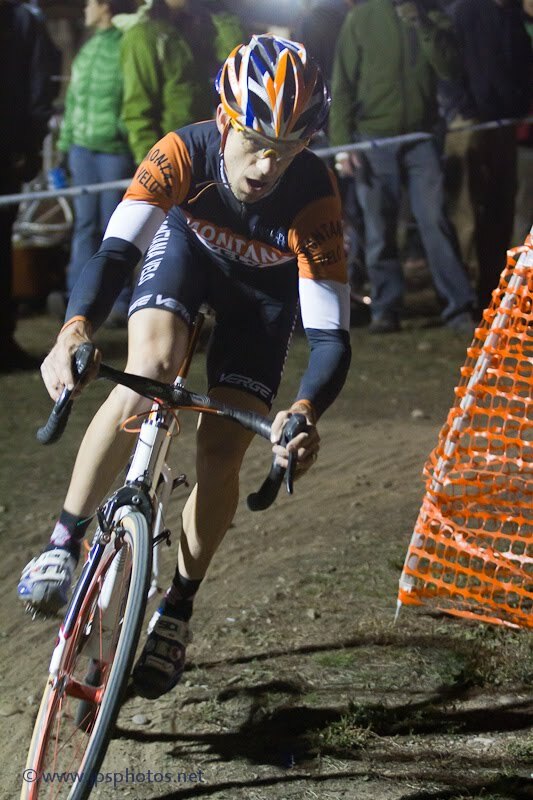 Smith rode well in New England last weekend and Studley finished 21st to Currys 24th in Portland #2. Still Lisa is a favorite for the podium and if the course is technical don't be surprised to see her up there. 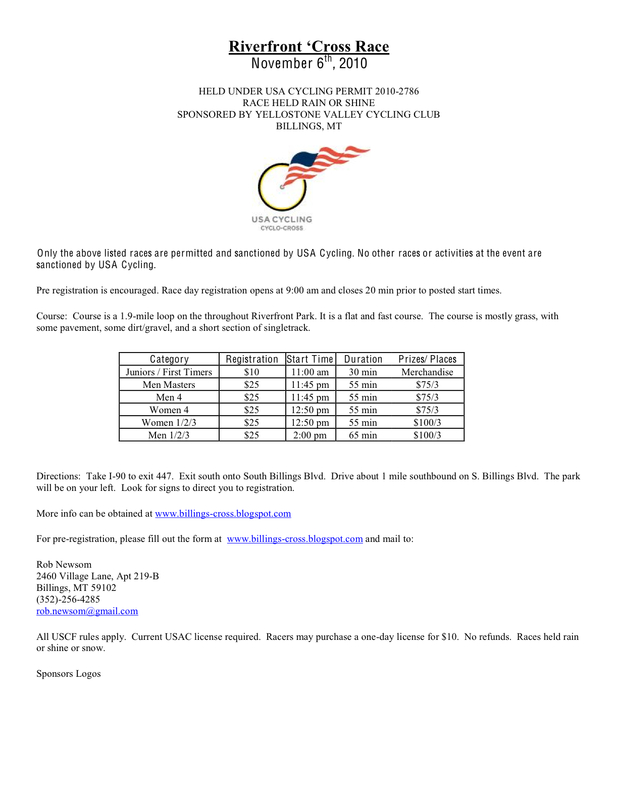 Also registered for this race is Julie Z. JZ has had a good 2nd half and could be in the top 15. AMY FRYKMAN - Mstr 35-39 - 2:15pm Friday - Last year in this event Amy was 8th. This field is stacked. The top 7 return and Howe (mstr 30-34 champ) joins the category. Frykman has been gaining form in anticipation of this race. If the rumor is true about the addition of pavement to the course then Amy could be competing for a top 5. Also in this race is 15th from last year PATRICIA DOWD. PDowd has been racing a bunch in the 2nd half of the season and would love a top ten in this one. Also in this category is Thunder all star Gaertner (4th last year). FRANK GONZALEZ - Mstr 45-49 - 9:30am Saturday - Frank has had his best season to date. 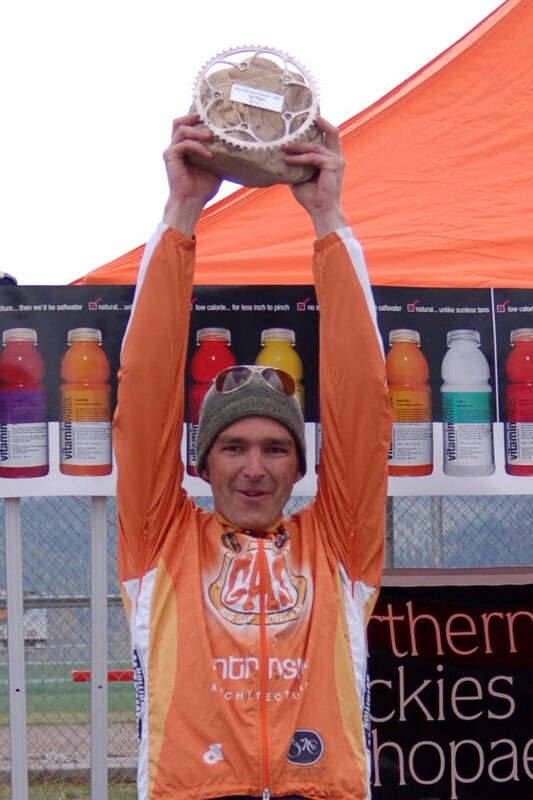 Top mountain bike performances in his age group and then a state title in Montana on the cx bike. Last year he was 13th in this race. The top 5 are all returning, with strongmen Bold and Coats as the favorites. However, Franky was 13th last year during a down season for him and I think those fellas better make some room on the cx podium. Frank represents one of the best chances for Montana to podium. JOHN CURRY - Mstr 30-34 - 3:30pm Saturday - Defending champ Berry is not registered, but 2nd place Pacocha is back and has been having a solid year. This category isn't as stacked as one might think. In my opinion John has the ability to ride into the top 5 on a good day. 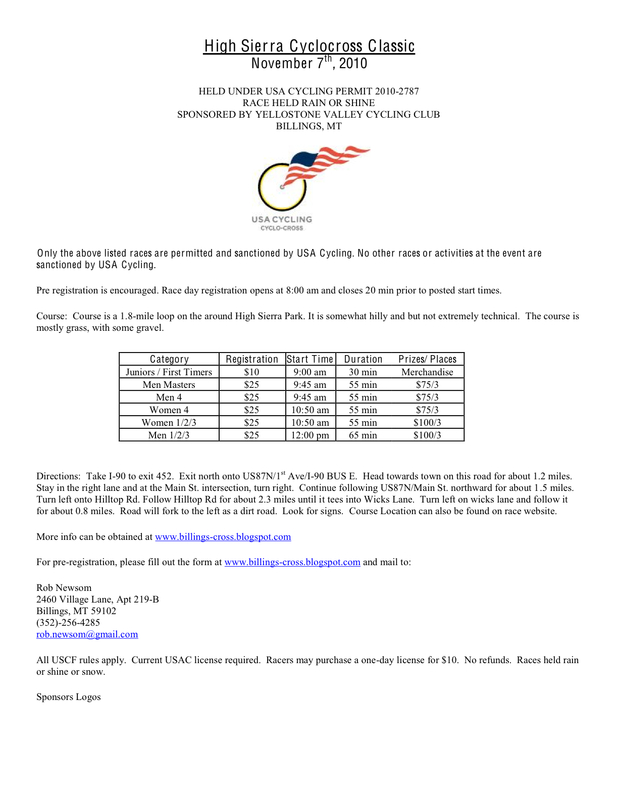 Looking at the start lists and other results my favorites are Schempf, Rasmussen, and Shriver (who could spoil the party for everyone if he rides to his ability). MTcx scoured the net for a Curry head to head against someone and found it. 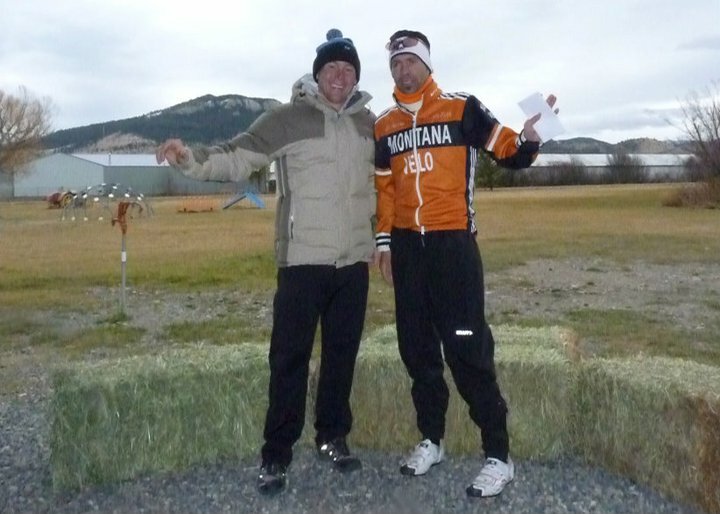 2009 Moose Cross Day 2, John Curry 2nd, Eric Rasmussen 3rd. Double A, Alan Adams is also in this category and don't be surprised to see him sneak into the top 20. Curry takes 6th in her best ever UCI result. Dingman continues her breakout campaign with a win in the cat 2/3 race!!! J Curry 19th in the dark! 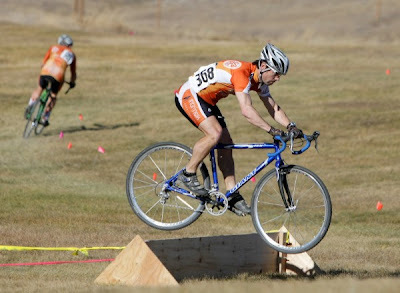 Good luck to Currys and Alan Adams at Jingle Cross. Griz/Cat Cross Photos from John Sieber. Frankie G goes on a tear! The battle lines were drawn early with Doll, Frank, and John taking turns at the front. Frank got the gap and settled in for the solo effort. Congratulations to Frank, I think the whole Montana cx community is happy for you! 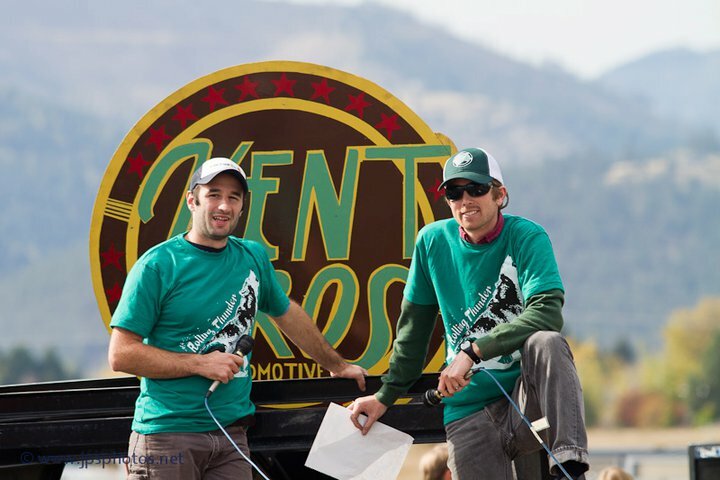 In anticipation for the upcoming "Brawl of the Wild" I did some research on who's leading the Montanacyclocross.com "Town Standings." Through Great Divide CX. 2. Helena 17 wins - Herzig's resurgence mixed in with Frankie's consistency is leading the charge, but the Brooke family and Finley have helped increase the tally. 3. Missoula 16 wins - Mostly led by Bridger and Campbell, Missoula also scored big wins from Kindred, Fiore, and Scotty. 4. Flathead 9 wins - Chance and Chauner lead this bunch, but a Killien and a couple others chipped in as well. 5. Billings 1 win - Rob Newsome is the man in Billings. 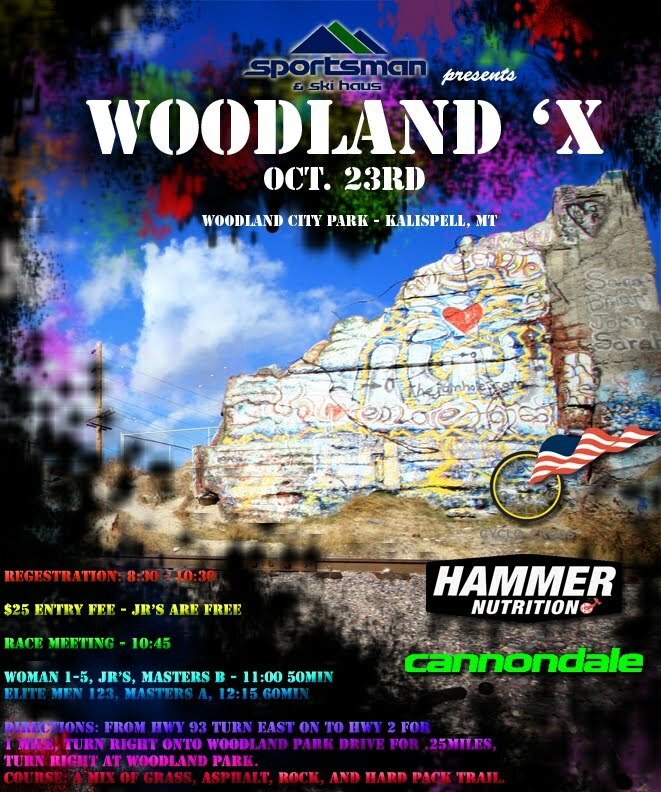 Griz/Cat Cross is Saturday and Z Cross is Sunday. This is the last race weekend of the Montana series. 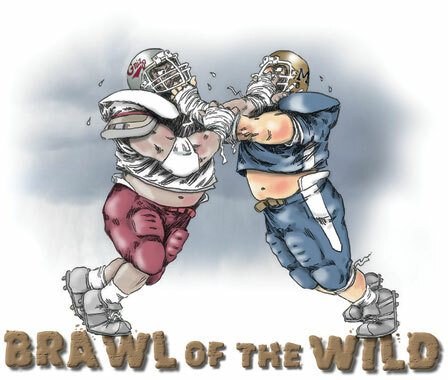 The battle for state glory doesn't get any better then this weekend. Snow, Fort Missoula, MSU vs UM, Velo, Flathead, GAS, and Cougs. Currys, Herzig, Frank, Chance, Doll, Campbell, Brooke, and Tomas all look primed for state titles, but anything can happen. Look out for local Mssla surprises. 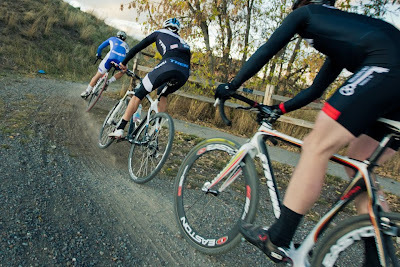 Sam is at La Ruta, but Missoula Bicycle Works could put together a surprise late season performance. Here's a video I've been watching to get pumped up for the action. It's a little older, but still top notch. 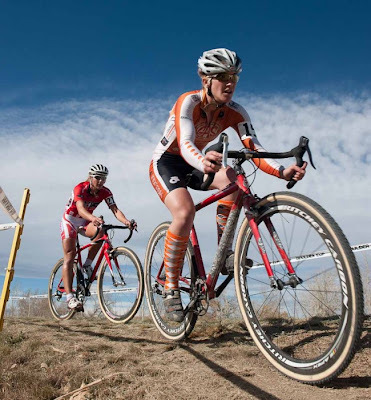 Lisa Curry took 15th on Sunday at the New Belgium Cup USGP. Curry excelled on the muddy Fort Collins course. With a 19th and 15th on the weekend LC takes a ton confidence into the latter half of the season. Thanks to Andrew Genco for the photo. Cougars and MT Velo are friends. I liked this photo from Tyler Brandt. Herzig, Franky, and Jesse continued their strong riding in Helena. Congrats to Great Divide and MT Velo on a great weekend. Lisa Curry 19th in Fort Collins. 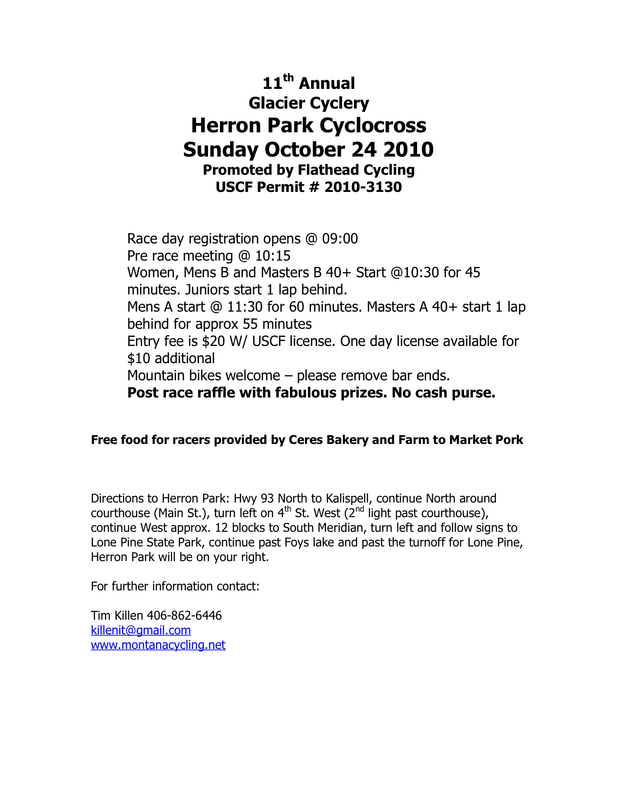 Big Time Helena Cyclocross Tomorrow!!! Mark Brooke and Rick Finley have done some great leg work to make this weekend's races top notch! Also, keep your eye on Currys and the Mules down in Fort Collins. Rob Newsome has put together a killer weekend of cyclocross in Billings. 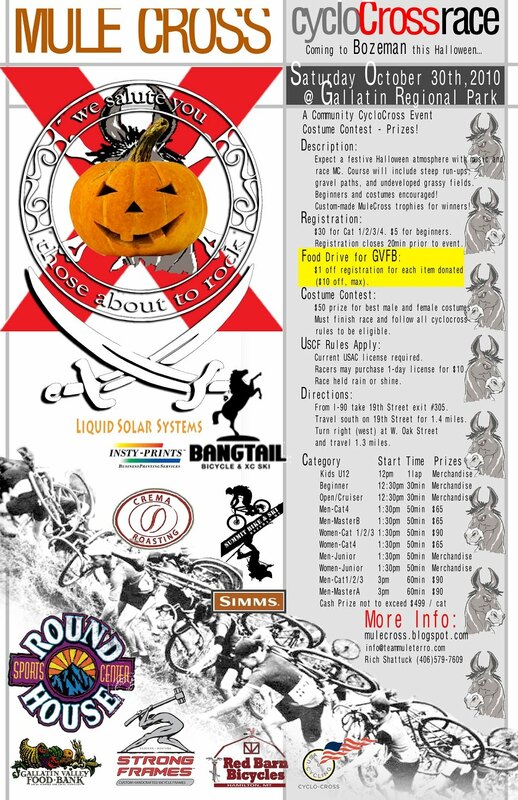 Get out and support this first year stop on the calendar. Tomrob's photo of Jaxson killing the run up at Thunder was my favorite photo of the season.......until I saw this shot on Velonews.com. Are you kidding me Lisa Curry?! The annual Halloween race Mulecross was another smashing success. Farther south, GAS riders mixed it up with Colorado's best. 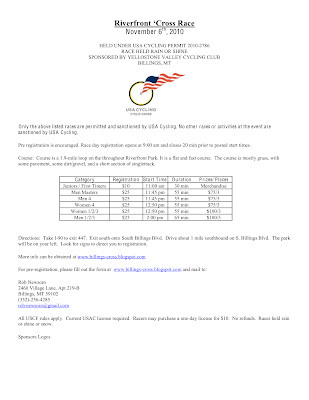 Congratulations to Anna Dingman for her big win in the women's cat 3 race. Lisa Curry was around 20 both days and John Curry was in the low 30's today. Jared Nelson rode well in the masters 35+. For photos of Mulecross, check out Frigid Light's album. Sam takes the race, Doll takes the series.